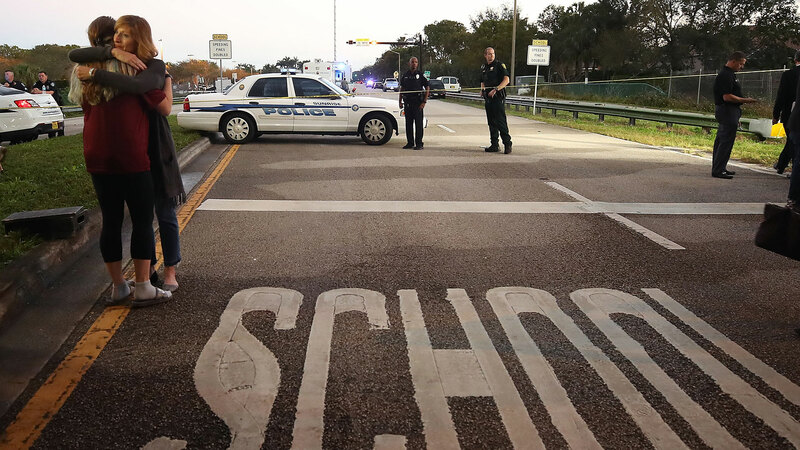 So many of us woke up this morning still processing the news of another mass shooting: this time in a high school in South Florida. Learning of this huge loss of life didn’t exactly make us ready to face the rest of the week ahead — in fact, a lot of people probably had the same question: How am I supposed to function and carry on like it’s a normal day after what happened in Florida? Even if we don’t have a direct connection to the shooting in Parkland, Florida, that left 17 people dead, it’s completely normal to react to the news with a mix of feeling helpless, guilty, depressed, anxious and angry. Logically, we know feeling bad about the shooting won’t actually help anyone, but we also need time to process the tragic events and not pretend it didn’t happen. Dr. John Santopietro, president and medical director of Silver Hill Hospital in Connecticut, was involved as a psychiatrist in the Sandy Hook shooting and has seen firsthand how people come together to survive during tragedies, as well as how devastating these events can be to a community. Unfortunately, he says that there is no formula for when someone should return to work and their usual routine after an event like the one in Florida, but emphasizes the importance of watching for signs of stress in anyone who has been affected, including changes in eating and sleeping habits, major behavioral changes or depressed or anxious moods, for example. When something bad happens, it makes sense that it makes us afraid or anxious. In fact, Dr. John Mayer, a clinical psychologist, says that being fearful is a good psychological and emotional protective mechanism during times of danger, and it’s OK to reexamine your behavior in terms of crowds and public events and be mindful of your surroundings. So how long is it normal to live with this fear? Dr. Nekeshia Hammond, a psychologist, says that experiencing these emotions for a few days or even a week isn’t uncommon, but if they last more than a few weeks and are to the point of affecting your ability to function in your work or family life, it may be time to seek out a mental health professional. Dr. Melissa Flint, associate professor of clinical psychology at Midwestern University, echoes that sentiment, saying, “The most important part is that you seek help if you need it.” This can be done by calling 911 in an immediate crisis or a mental health hotline. You know that feeling where next to the tragedy everything else seems frivolous? According to Hammond and Lindsey Pratt, a psychotherapist in New York City who specializes in trauma, that’s a form of survivor’s guilt and another common reaction to the events. Dunblazier explains that “guilt is the presence of unexpressed grief and heartbreak” and that expressing anguish through crying or an emotional response is a skill set and not weakness. But why are we feeling guilty about something we had nothing to do with? Dunblazier says it’s a common experience to transfer your grief and anguish from things you can’t control — like these mass tragedies — to things you feel you are in control of, like your friends, family, work or social situations. In this case, she says it’s important to practice self-awareness by asking yourself what you’re feeling and where it originated as well as taking five minutes at the end of the day to reflect on your emotions and release them. One thing to watch out for, says Dr. Paul Hokemeyer, an addictions therapist and certified clinical trauma professional, is destructive forms of self-medicating, specifically excessive alcohol consumption, overeating and another reckless behavior. Engaging in these will only add to your sense of hopelessness, he adds. Yes, the mere act of going about with your regular routine when a major tragedy just occurred could be the source of guilt, but it could also do you some good. Dr. Robin Goodman, a licensed clinical psychologist and art therapist with particular expertise in trauma and bereavement, suggests balancing what it’s necessary in your life to continue to do with what you can do to help others. Along the same lines, it’s important to stay engaged in some routine activities — even if you’re not at full speed. Similarly, Hammond suggests limiting your intake of social media as well as news outlets. “If it feels like too much to process all of the details, videos and articles that emerge, be sure to take a break for your mental health,” she adds. Whenever something bad — or good — happens, you know there are certain family members and/or friends who will have strong opinions about it and perhaps get you all riled up. There’s a time and place for those people — and this isn’t it, says Richale Reed, a therapist practicing in North Carolina. Instead, reach out to people who will help you process what happened in a constructive way. Several of the mental health professionals suggested taking some sort of action as a way of proactively dealing with your feelings of helplessness. This can range from doing things that will help you personally to those that also impact the community. Giving blood and finding meaningful volunteer opportunities are always good options. In addition, Wagner suggests doing things like reaching out to your loved ones to let them know how much they mean to you and making an emergency plan with your family so you know how to respond should something like this happen to you. “In these moments, finding ways to express compassion where we are able, in our spheres of influence, become the ways we can make a small impact in our worlds that feel so out of control,” Flint adds.